Adventures into the Unknown - ZineWiki - the history and culture of zines, independent media and the small press. Adventures into the Unknown is an edition, produced by Patrick Rieve on the occasion of the exhibition Skeleton Key. 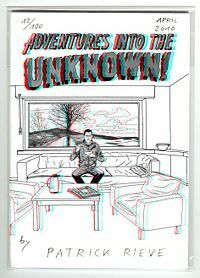 The cover shows a 3D-comic-panel (8 layers) which is only completed as a cover with date, number and signature by the author. It is one of Rieve's artistic references to classic comic titles (See also: Justice Traps the Guilty and Homework). This page was last modified on 21 November 2013, at 09:54.